Utah based Saygus is looking to make an impact on the premium smartphone segment with a device that compromises little in the way of form or function. The V2 smartphone is the device Saygus will use to make that impact, and it has garnered a lot of interest from around the world as word has spread about the device. Saygus received orders from over 40 countries during the initial pre-order promotion in February, and rightly so. This global-LTE-ready device is packing competent hardware and a number of features that few smartphones have in one package. The retail price of $599 is not too rich either when you consider what you get for the money. The Saygus V2 will pack a largely stock Android experience, version 4.4.4 KitKat initially, though Lollipop updates are being worked on at this very moment. The bootloader will be unlocked for those that must tinker with Android. The CPU is a Qualcomm Snapdragon 801 which is a proven and capable chipset with 3GB of RAM to shuffle things around. 64GB of storage can be expanded by two microSD slots, each able to handle 128GB and provide the ability for the device to dual-boot. Aside from the two microSD slots, the V2 also sports dual front-facing speakers utilizing Harman Kardon audio tweaking. This device will have two monster cameras too, each with optical image stabilization – 20-megapixels on the back, 13 up front. Wireless gaming and mobile beaming are supported too thanks to a 60GHz transmitter. Saygus anticipated that the first shipments for those that pre-ordered could be as early as late-March with commercial rollout in the second quarter, but as the final details were being sorted in the assembly, a couple issues were discovered. First, the camera hardware integration took a bit longer than anticipated. Second, there was a component production delay due to some quality control issues involving the antenna design. In a non-manufacturing related item, Saygus is working on some international distribution channels which may save some international buyers extraneous VAT costs. Taken together, Saygus says its ship date will be May 22, 2015. For those that choose to hang in there, Saygus is throwing in a set of SqGl (“squiggle”) 3D earbuds as a consolation measure. However, if May is just too far away for you, Saygus will support a request for refund. 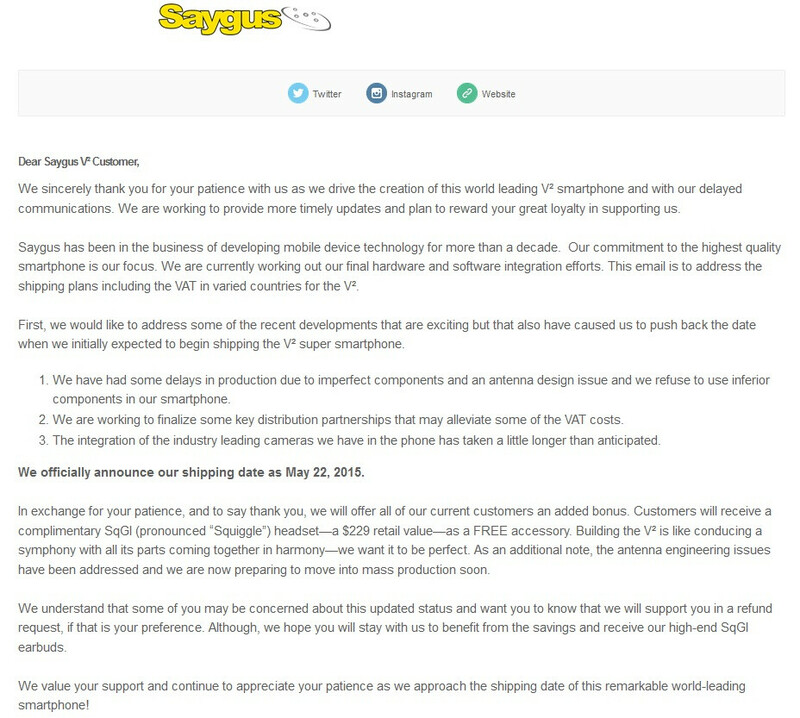 Did you order a Saygus V2? Are you going to hang in there and wait? Things I've noticed: 1 - 4G LTE logo looks IDENTICAL to those used for Sprint 2 - The dialer and web browser app icons are blatantly stolen from TouchWiz 3 - 13MP ffc w/ OIS? Holy s--t! 4 - No mention of the battery capacity This phone definitely should be on peoples' list this years. 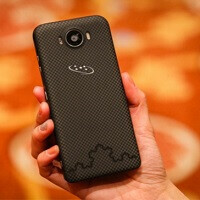 true this will be a good phone if they can get it on market fast and it has a competitive price tag. That home screen in the above pictures is also fake as it shows no navigation buttons and we know the navigation buttons are on-screen for this handset. they didn't mention the screen size though... for years (YEARS!!!) i was a devoted HTC fan but with the m9 having allegid troubles i'm having to broaden my horizens. which requires a phone between 4.7 and 5"... also, it's a pretty long list of explicatives that if i want a phone that size i have to sacrifice half the specs of a flagship. They will keep this delay till canceling it like their first V phone. Just a vaporware! I made an order and it's worth the wait. It's not like the world will end if they won't deliver in April. It's not the end of the world but it maybe the end of your $600. Decided that I can wait till summer. So, did not cancel mine. Saygus announced that they will support Sandisk's new 200 GB microSD cards. So that makes the storage of this phone able to max out at 464 GB. That is a lot of stuff you can keep on your phone!